A lot has changed since the lake was impounded in 1964. This man made impundment is the fourth in a series of six lakes on the Coosa River System, has gone through some changes as well. Fishing pressure on this 15,263 acre lake (located less than 40 miles from downtown Birmingham) has increased with each passing season. The nearby rapidly growing town of Pell City lines the lakes shoreline and new residents are moving in each week. Many race fans coming to the nearby town of Talladega and the growing town of Anniston is just up the road, all of which border Interstate 20 that crosses Logan Martin Lake. Today anglers from all over the country are now fishing Logan Martin Lake every day. So how can a lake survive with so much evident fishing pressure day after day, year round? Even though Logan Martin lake stretches almost 50 miles from upstream Neely Henry Lake dam to lower Logan Martin lake dam, it is still very susceptible to intense fishing pressure and it is beginning to show. Anglers fishing bass tournaments featuring a 5 bass limit, struggle to even get 5 bass in the boat in an entire day of fishing. Twenty years ago an angler could easily get 20-30 bites in a days fishing. In 2007 no matter where many of today’s anglers fish most anglers struggle to even get a bite. Back then (over 20 years ago) many major bass tournaments were being held on this lake weekly. It often took a 7-8 pound largemouth bass to get biggest bass of the day…and that was with only 50 boats! Today with as many as 200 boats in some major bass tournaments (that’s 400 anglers), it often only takes a bass weighing in the 5-6 pound range to get big bass honors. Winter does help. Its a time of year when fishing pressure slows but does not come to a halt. December is the last month of the year and most tournament trails have ended. Hunting season is at hand, football season underway and holidays all show fewer anglers on Logan Martin Lake, less anglers sampling her waters than during any other season of the entire year. Same goes for January and February, just too cold for most anglers and very few bass tournaments are out there. But as soon as March arrives, so do the hordes of anglers all experiencing cabin fever, including tournament trails, annual events and just plain “anglers everywhere” shows another 9 months of intense fishing pressure for Logan Martin Lake…fishing pressure that never lets up, it just slows down for winter at the years end. So let me say, if you frequent this lake like I do, make it a point to visit Logan Martin Lake this winter season. You will find less company, often a fishing hole all to yourself and possibly you may discover that huge school of big bass coming up to feed for one last time before going back to the deep with the next cold front. I know a lot of anglers fish Logan Martin lake. But there are many anglers that visit this lake for the first time and they need a little direction and fishing advise. So here’s a few pointers for you first timers and those that are less experienced than others at navigating and fishing Logan Martin Lake, during the winter months of December, January and February. That is a common word and most anglers know this means driving your boat. On Logan Martin Lake (when the lake is down 5- 6 feet for winter pool) that means navigating with extreme caution! I mention this a lot in all fishing tips and lake reports I write and for good reason. From experience, like most anglers that fish these Alabama lakes in all seasons, I have hit an underwater obstacle a time or two in my day. It can happen to anyone, but it is always a big inconvenient thing to happen and often a costly mistake, one that could have been avoided. Of course if an angler is unfamiliar with a lake, or if he/she is used to running all over the lake when it is at full pool, then he/she may not be aware of the dangers of navigating Alabama’s lakes that are lower than normal full pool levels, like during winter. This is not new news, especially this past year, from a period that started in late spring until this winter season, it has been very common with lakes like Logan Martin to be lower than in years past. So, exercise extreme caution when navigating low water impoundments. Start with getting a good map. If you cannot read a map then have a friend help. Talk to anglers and boat dock owners, people that know these lakes and always use your depth finder when navigating. Also use a little common sense. Running the boat out of a marked river channel or creek channel, is always asking for trouble. Logan Martin Lake is about 50 miles long. At its mid section Interstate 20 crosses the lake. It is about 25 miles up the lake to upper reservoir Neely Henry Lake dam. But a treacherous run when low water shows stumps and rock piles in mid river sections. As an example, right before reaching the mouth of the last creek on your right in the lakes headwaters (2 miles below Neely Henry dam), O’Hatchee Creek, there is a huge rock pile of scattered boulders right in the middle of the river. Running your boat down the lake (from the I-20 crossing heading south), you will see very few red and green channel markers, so basically your own your own. But its ok. Just stay in the middle of the lake, all the way to Logan Martin Lake dam and your in safe water. Getting out of the main river channel and traveling up in any creek calls for map study and caution when navigating in shallow water less than 10 feet deep. 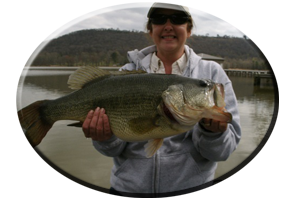 Since Coosa river spotted bass and largemouth bass both exist on this lake you can catch bass of both species in most places found lake wide. Low water was evident all summer long (including drought) and no rain of any amount on into the fall season, showed the lake displaying very little aquatic weed growth. Normally, when the lake is at full pool and weeds thrive all year these green, oxygen rich homes show plenty of Logan Martin lakes largemouth bass take up residence here. Although some spotted bass can be caught in and around aquatic weeds they are known to prefer a more rocky terrain, a hard bottom and they like areas of the lake displaying current breaks, such as along points, around islands and along stump rows. Now with the lake down 5-6 feet for winter, these bass of both species mingle together in some very predictable places. They are now found bunched up in places exhibiting either wood or rock cover or some sort of bottom irregularity. Another thing that very little rain has shown to effect the bass fishing is water clarity. Clear water conditions always makes fishing slower, catching them tougher, or its just plain harder to get these bass to bite at times! Years ago we got a lot of rain most of the year and water clarity showed to be stained to muddy water at times. Those bass used what is called their “lateral line” a built in inner ear, that aids them in detecting potential meals coming their way in off colored water clarity. They could not see as well and they were easier to fool into striking your big, gaudy type lures. Anglers today are downsizing their lures to adjust to the clearer than normal water clarity. Winter is normally a time of heavy rains, so lets hope we get plenty of rain and see Logan Martin Lake get back to normal and eventually return to full pool next April. Need help on Logan Martin Lake? Always call on Reeds Guide Service…first! 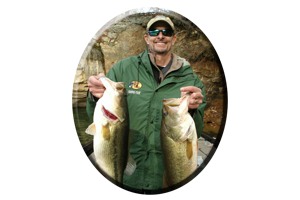 “Over 40 years exploring and guiding on Logan Martin lake and every lake in Alabama” Several guides available year round for multiple parties and corporate guided trips. See my website: www.fishingalabama.com for more info, articles and winter fishing tips. * Need more info for Logan Martin Lake and other Alabama lakes? 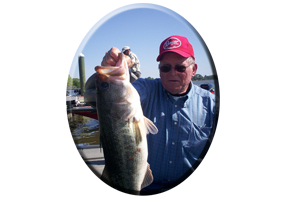 Watch for more fishing tips, lake reports and fishing articles at my website for all of Alabama’s lakes, for every season. * Always call on Reeds Guide Service…first! 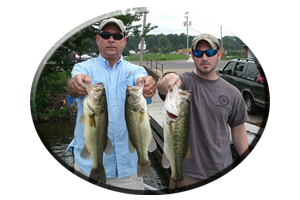 Alabama’s most well known, freshwater bass & striper fishing guide service. Logan Martin Lake’s oldest, professional guide service! Several guides and boats available, year round, for multiple parties and corporate guided trips. Discounts available.